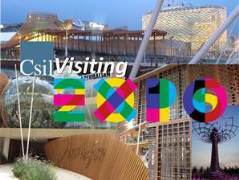 EXPO Milano 2015. The wood Renaissance. Until October 31st EXPO MILANO 2015 offers the opportunity to make a six-month journey around the world under the all-embracing theme: ‘Feeding the Planet, Energy for Life’. The EXPO area is easy reachable through highway, railway and subway (Rho Fiera Expo station). Although the exhibition site covers nearly 1 million sq.m., the whole layout is intuitively clear, with a main boulevard Decumano (1.5 km long) crossing a shorter avenue Cardo, that leads to the Lake Arena, with the iconic Tree of Life. The EXPO theme takes form in a number of surprising ways, and there is a lot to see and to enjoy. Over 130 countries welcome visitors accompanying them in this journey and introducing their traditions, lifestyle, handicraft and colours, not to mention food and cooking habits. Participating countries are strongly committed to presenting strategies for ensuring that everyone in the future can have a healthy and sustainable feeding. Advanced solutions for agriculture and water management, possible paths towards food independence and poverty reduction, the value of biodiversity on earth and sea, visions of tomorrow’s fields, sustainable seeding and harvesting, and food safety for a future shared prosperity are all presented here. When it comes to EXPO architectures, this is a kind of ‘Wood Renaissance’. Figures speak for themselves: 24 national pavilions (almost one half), 31 cluster buildings, all service architectures and some buildings in dedicated areas have been entirely built using wood. Reportedly, wood is choice material for 70% of all buildings at EXPO 2015. Due to the fast-building properties and high performing qualities of wood as a light, safe, beautiful, eco-sustainable, clima-balancing and energy saving material, it is a shared opinion, that it was a true winning option. Wood proved once more to be a versatile material for structural use, for flooring and wall covering, and a fascinating decorative element for the beautification of the pavilions.